Which are your favorite car shows? I have been going to car shows for as long as I can remember. Not all car shows are created equal. I like just about all types of shows and car related events, but for different reasons. Your local community car show. These shows are put on by your local church, school, VFW, small town, etc. There is usually a charity or fundraiser tied to the event. They are smaller and a lot of people know each other. For me, the local show is about community, friends, people you know, and raising money for a charity or organization that is in your own backyard. Local cruise-in. Not a show where you win an award, but an event where anyone and everyone can show up and show off their special car, truck, or motorcycle without worrying about being in a competition or being judged. These can be as small as a few cars and as big as several hundred. The cruise-in is just flat out fun! No stress, no cleaning if you don’t want to, just hanging out with a bunch of car guys talking cars for hours. Major custom/hotrod show. Usually last several days with several thousand cars. These events take place at state fairgrounds and very large venues. 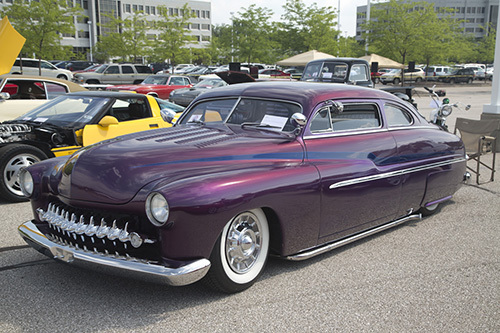 Major car shows have a huge amount of cool customs and hot rods to look at. You can have just as much fun as a spectator as you do being a participant. I always walk away with some cool ideas and admiring all levels of custom work. Concours. These are elite car shows where the best of the best are in attendance. 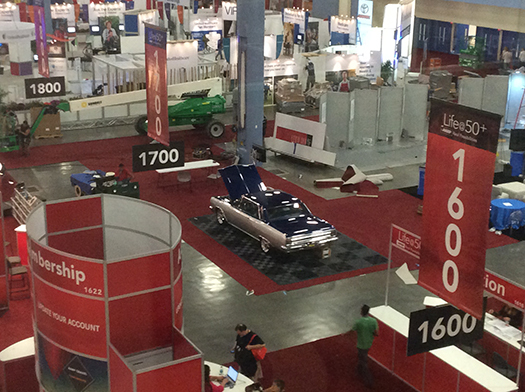 Usually lasts one day, but there are numerous other car related events leading up to the show. 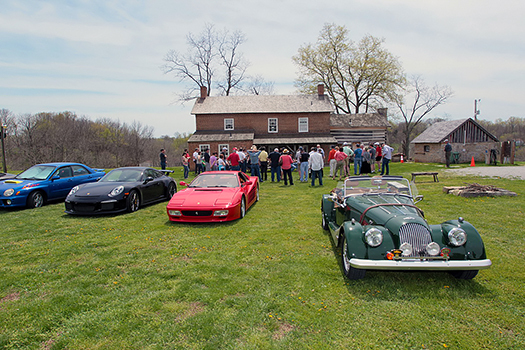 Concours events are at the top of the spectrum. You will see cars you have never seen before. You will also see the highest quality restorations you have ever seen. Road Rally. 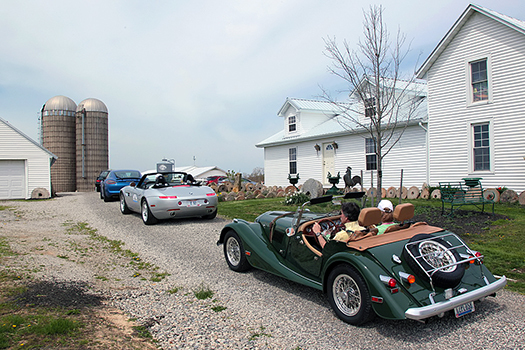 Small or large, these events involve a group of people getting together to drive their cars to specific destinations. It is about the joy of driving your classic car and being with people that like to do the same. How could you not have fun driving your old car with fellow car people that share the same passion for “driving” vintage automobiles? You should be able to find something you like from each type of show. Regardless of which event you participate in or attend, you will have fun, be with good friends both old and new, and be part of a hobby that is one of the greatest in the world! Share with us your favorite show and why! As the team continues on, they now have the firewall plate in for the flaming river steering column, which was slightly modified for the clutch rod. The brand-new steering column is ready to slide into the plate and attach to the dashboard with a single mount. After the installation, there’s a few loose ends to tie up. The steering shaft needs to connect from the firewall to just past the engine block. 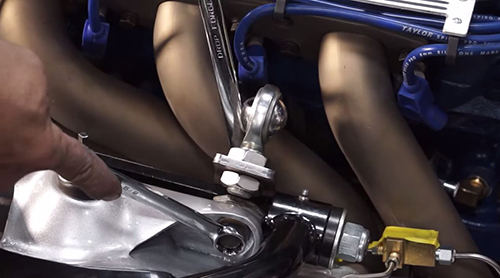 In order to do this, the team will need to mount and install a carrier bearing next to the headers and suspension. 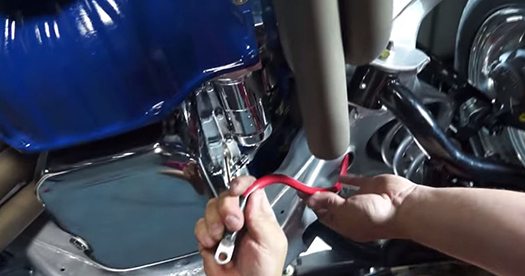 In order to install the carrier bearing, they’ll have to loosen the suspension and install a bolt long enough to handle the bracket. The steering linkage from the steering column is now completely mocked up, and it’s time to mark the set screws, put a dimple in place so that when the screws are set in, they will be locked in place. After the steering linkage is completely where it needs to be, they will put the lock tight on the set screws. They will then install the stock steering wheel so they have control of steering the car back-and-forth, but just wait until you see the custom steering wheel they had made. 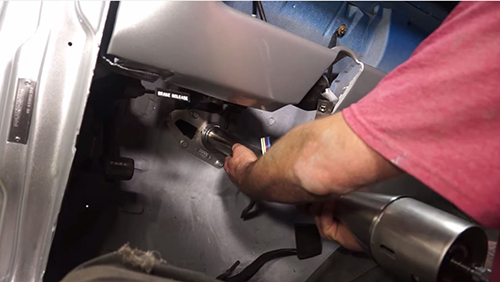 Now that the steering column and linkage is installed, watch as The Build team continues to restore the’65 Malibu restomod. Watch the other episodes on our YouTube channel, and stay up-to-date with the progress of our classic car on our Facebook page too! It would be safe to say that the majority of the people reading this blog post are gearheads with a penchant for mechanical pieces whether they roll on the ground, skip across the water or fly through the air. While we get pulled in by the fascinating bits and pieces, giving hours of attention to care, recreation and research, most of us would agree that the people are what make certain events and activities more enjoyable and most memorable. Every June, the second Sunday is reserved for the Ault Park Concours d’Elegance, where I recruit two seat Sports Cars up to 1959 for the Sports Classic category. These cars bring a smile to everyone’s face, Porsche, MG, Jaguar, Corvette, Alfa, Morgan, Triumph, Lotus, Ferrari, Siata, Austin Healey, all the little cars that are big fun! 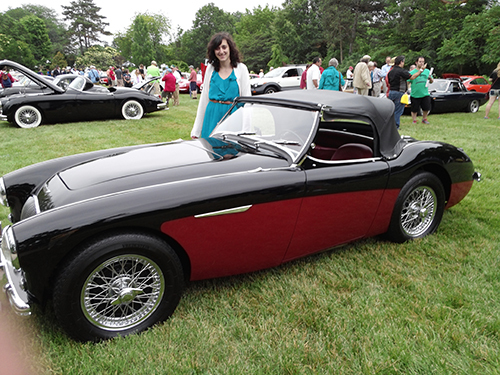 For 2014, an Austin Healey 100 BN2 was scheduled to appear on the field, registered by Gary Feldman from northern Ohio; the car had undergone a thorough restoration including extensive work performed in the Feldman’s garage. At Ault Park the cars wind down the garden paths to get onto the show field. The Big Healey drew attention as it picked it way through the gardens to take up its position amongst the other sports cars on the show field. As the 100-4, black with deep red inserts, and matching deep red interior, rolled across the lawn with the hood up to keep the morning dew at bay, one couldn’t help but notice the young lady in the passenger seat sporting an enormous grin. Ashley Feldman beamed from the right seat as her Dad, Gary, put the car on its marks; she popped out of the right side and went for the detailing equipment before Gary could extract himself from under the raised top. 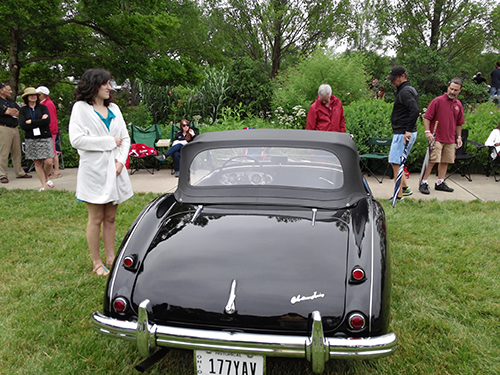 After a brief introduction, the Feldman’s prepared the car for the judging and spectators as I took the opportunity to look over the decidedly luscious Healey. Both Gary and Linda, Ashley’s Mother, took time to explain the depth of Ashley’s involvement in the restoration of the 100-4. From the day it was brought home as a used sports car Ashley developed an affinity for the car and claimed it part and parcel as “Her Car.” When the restoration process began, Ashley delved into the project alongside Gary, handing tools, reading instructions, pushing cables and pulling wires – all the fun stuff of the restoration project. Ashley faces special challenges with learning daily, vintage sports car restoration is a challenge she enthusiastically accepts and enjoys. A young lady proud of the car she put on the show field, as she well should be; Big Healey’s are quite the find with Concours recruiters. Few and far between, it is always an honor to have one on display. 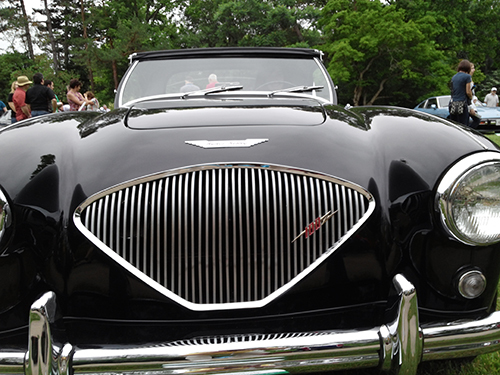 To have an exemplary Austin Healey adds immeasurably to any Concours. To have a Big Healey with such an exemplary story is very rare. 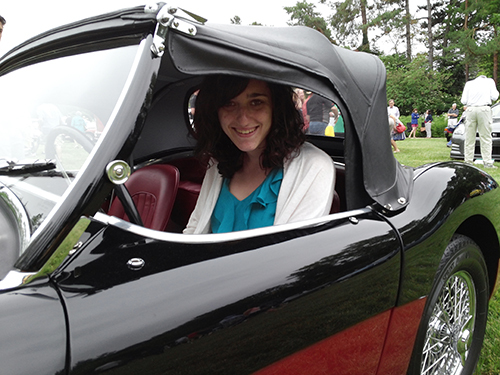 A young lady restoring sports cars with her Dad and embracing the hobby is a refreshing twist from the daily grind. Thanks to Ashley and the Feldmans for adding even more delight to our day. Rick will wrap it up and over the starter, to the solenoid. That way there is plenty of clearance from the header, because the headers can literally burn the coating off of the battery cable. Rick will then cut around the outside cover, in order to crimp in the end to pull it right up to the starter. The fuel hose and battery cable are now installed, everything is connected that needs to be connected, and it’s time to put the body on, and mount it to the frame for the final time. The crew will wheel the frame out, and lift the body up, then lower the body down onto the frame. 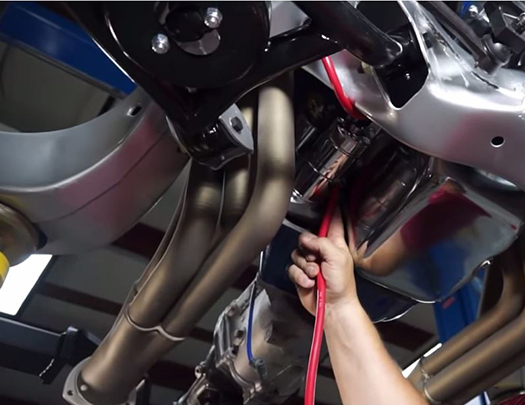 In order to align it up exactly, it takes extreme attention to detail, along with exact measurements. The body bolts will be hand-tightened first, and then again will be tightened to the chassis and the frame with an impact wrench so it’s nice and snug. The body is now mounted to the frame, with the engine sitting pretty low. So luckily the coil-over shocks will allow for adjustments, in order to clear such things like speedbumps. 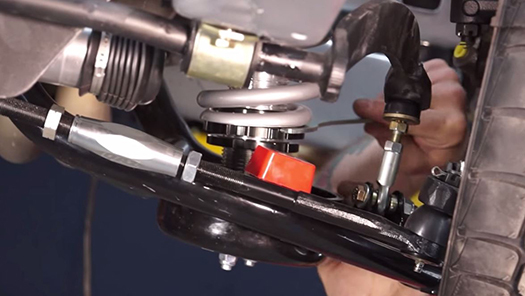 Moving the springs on the adjustable shocks with the bottom knuckle lock blot, to the shock to the spring. Now that the frame has been bolted back onto the chassis, watch as The Build team continues to put back together the 1965 Chevy Malibu restomod. Make it a priority to watch the other episodes on our YouTube channel, and follow the progress of our collector vehicle on our Facebook page too!